The Slam Stick™ is a high speed, ultra portable, rechargeable, data logger capable of measuring acceleration in all three axes. The device uses a USB Port for on the fly configuring, charging and downloading of data. It is seen as the first step for developing any vibration energy harvesting system, and can also be used to characterize g-levels and vibrations in machinery, perform modal surveys, or in other situations where a quick and easy vibration measurement is required. The Slam Stick vibration recorder measures vibrations. This is an easy to use tool. Just attach it to your vibrating surface, turn it on, and then plug it into a USB port to derive data such as frequency and amplitude. To harvest energy from a vibrating source you first need to ascertain the frequency and amplitude of the vibration. Until now this has been a difficult and expensive step. The release of the Slam Stick™ Vibration Recorder now makes that information more accessible, and is seen as the first step in developing an effective vibration energy harvesting system. The Slam Stick can also be used to characterize g-levels and vibrations in machinery, perform modal surveys, or in other situations where a quick and easy vibration measurement is required. The Slam Stick™ is a high speed, ultra portable, rechargeable, data logger capable of measuring acceleration in all three axes. 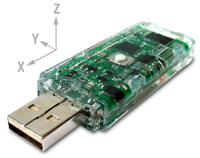 The device uses a USB Port for on the fly configuring, charging and downloading of data. Simple configuration software included with the product allows users to tailor the device to their specific needs. This low-cost ($200) device has a small USB stick form factor, built-in rechargeable battery, and USB thumb drive interface that can be used without installing drivers. Software lets you set test parameters and analyze data to optimize energy harvester use. Chris Ludlow, Midé's Director of Engineering said, "This is an easy to use tool that complements our Volture™ vibration energy harvesting products. Just attach to your vibrating surface, turn it on, and then plug it into a USB port to derive data such as frequency and amplitude. You can then determine which Volture or other Energy Harvester is best suited for your application." Midé Technology, a Boston based smart technology company, uses the Volture™ Vibration Energy Harvesters to convert otherwise wasted mechanical energy, in the form of vibrations, into useable electrical energy. This is achieved by utilizing the unique properties of piezoelectric materials, and a patented packaging process (The QuickPack™ Advantage) to dramatically increase the robustness of these delicate materials. This electrical energy can then be used to recharge batteries or power low-power wireless sensing systems. The Slam Stick™ configuration options include an adjustable delay time before each measurement, different measurement durations, and a trigger based on a pre-determined acceleration level. Free analysis software allows for complete vibration characterization enabling the user to determine the frequency content of their given vibration. The Slam Stick™ Vibration Recorder, and Volture™ Vibration Energy Harvesters are also available at Digikey. The Slam Stick Vibration RecorderThe Slam Stick Vibration Recorder image Slam Stick Data SheetInformation, specifications, and instructions for the Slam Stick Vibration Recorder.